Today is Tuesday. Day three of our Freedom of the Seas cruise. 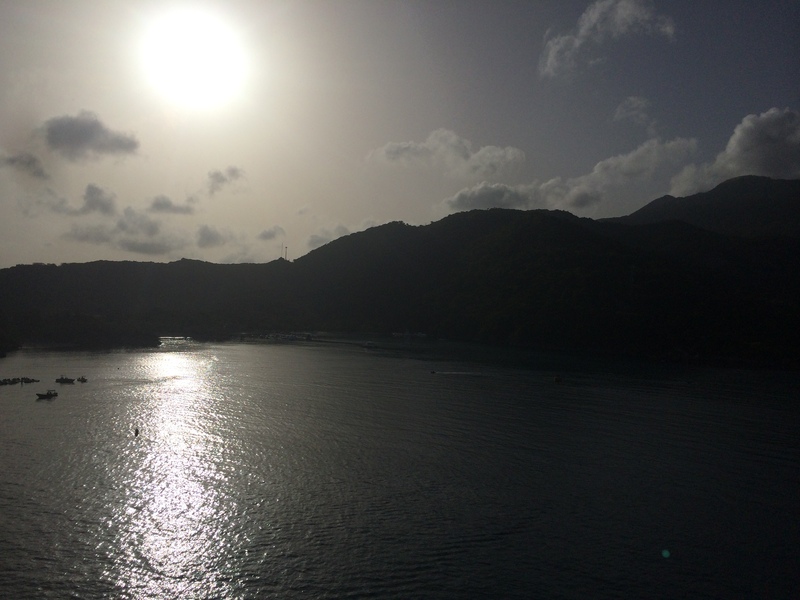 Today we are docking at Labadee, Haiti. It is commonly called Royal Caribbean’s private island, but that is a misnomer as it is not really an island but the tip of a peninsula that has been gated off for Royal Caribbean’ s use. Royal Caribbean has built its own little enclave here for its passengers, its kind of a “free” port. Your seapass cards work here and there are no local excursions to go on so it does not do much for the local economy, but it is a nice beach day. The last time we were here, OD and TJ did the AquaPark (which they did not like at all), and the Dragons Tail roller coaster (which they loved!). This time we were just going to hang at the beach and relax with some island drinks, but first we had a special breakfast to attend…THE CHOCOLATE BREAKFAST! The Chocolate Breakfast is an event (mostly) geared towards the younglings. The entire menu is chocolate: chocolate donuts, chocolate pancakes, chocolate milk, chocolate shakes, chocolate sauce for dipping, and on and on. It is a chocoholics dream. My kids were pretty excited about it too! Fortunately for those who don’t view chocolate as a food group, there is a selection of “standard” breakfast fare as well. The other big draw for this event is the appearance of the Dreamworks characters. Towards the end of the meal, a group of three Dreamworks characters come out and interact with the younglings for dancing and pictures. Each Character breakfast has different characters that come out to play and there are two character breakfasts on each seven day cruise…we had to go to both, of course! So there we were, bright and early in the dining room with a gaggle of other weary eyed parents and excited children that had just been promised chocolate for breakfast!! The younglings could barely stay seated and wolf down chocolate food, they were so excited about seeing the characters. FINALLY, King Julian, Alex and Gloria from Madagascar came out to meet and greet and dance and sing. Once KT had seen all of the characters, gotten stickers from all of them and subsequently placed those stickers all over her body, we were ready to go. Freedom docked in Labadee early, like 8am or something like that. We were not planning on getting off the ship until 12 or so, so M and I headed to the casino where we both entered the next qualifier for the slot tournament later that afternoon. We left the ship at around 11:30am and caught the tram to Nellie’s Beach to look for some chairs, hopefully in the shade. The good thing about leaving so late was that there were people there that had been there for hours already and were headed back to the ship so we were able to grab a group of loungers under the shade of some palm trees. Overall a great spot…close to the bar (still working that drink package! ), and close to the water. We promptly headed for the bar for some famous Labadoozies, but they were out of the mix and waiting for someone to bring them some more so we settled for cold beer in the meantime, vowing to return shortly for the signature drink. We slathered everyone up in sunscreen and headed into the water. August in the Caribbean is HOT and the water was only slightly cooler, but mostly clear and completely calm. KT has entered a phase where she will not touch sand, at all. But she loves being in the ocean. So we pretty much stayed in the shallower water so I could stand and still hold her without too much trouble. The roped off swimming area was crowded, but manageable. There are other swimming areas available, but we ended up at this one and it was fine. There are no real waves to speak of so it is fine for little ones. A bit on the boring side for teenage OD, but relaxing just the same. Feeling suitably waterlogged, we headed back to the chairs to relax…and of course check on the Labadoozie! After slurping down a couple (all right, a few) of the signature beverage, we headed back to the ship to get some lunch at the buffet. Then it was time for some serious napping. After all, fresh air and sunshine will wear you out! KT and TJ went to relax and watch a movie, but it was time for M and I to head to the casino for the slot tournament qualifier! P joined us as our cheering section. There were several qualifiers throughout the cruise and the top scores would then all compete in one of three semi-finals with the winner of each semi would move on to the finals on Saturday. If you got knocked down the list of overall qualifiers, you could enter another round and try to better your score. P was ranked 5th overall, so he was not worried at this point. The way the qualifier works is the casino sets up specific slot machines, you find the one with your name, when the bell goes off, you push the button as fast as you can in order to get as many points as possible in the five minutes allotted. The starting bell rang and bang, bang, bang, bang. I started pushing that button for all I was worth. It seems so simple, but by about three minutes in, my hands and arms were burning and my freshly painted manicure was shot! The crowd was cheering behind me, but I could only focus on my placement on the big board. At the end of the five minutes, my arms felt like wet noodles, I needed a drink like no one’s business and…I WON!! I came in first place in the qualifier and into second place overall. Not to bad considering I had never touched a slot machine before my Allure cruise two years ago, and I hadn’t touched one since until this cruise. After all that excitement, we went back to the cabins to change for dinner, had more wonderful cocktails at the Champagne Bar before dinner and FINALLY, had a very good dinner in the Main Dining Room. Our waiter, Norbert, was finally on point, KT got some AWESOME “green pasta” (spaghetti with pesto), and overall it was a very relaxing dinner. Exactly what we had come to expect on the Freedom, now we wondered what we would get for the rest of the week, hopefully this was a sign of things to come more so than last night! 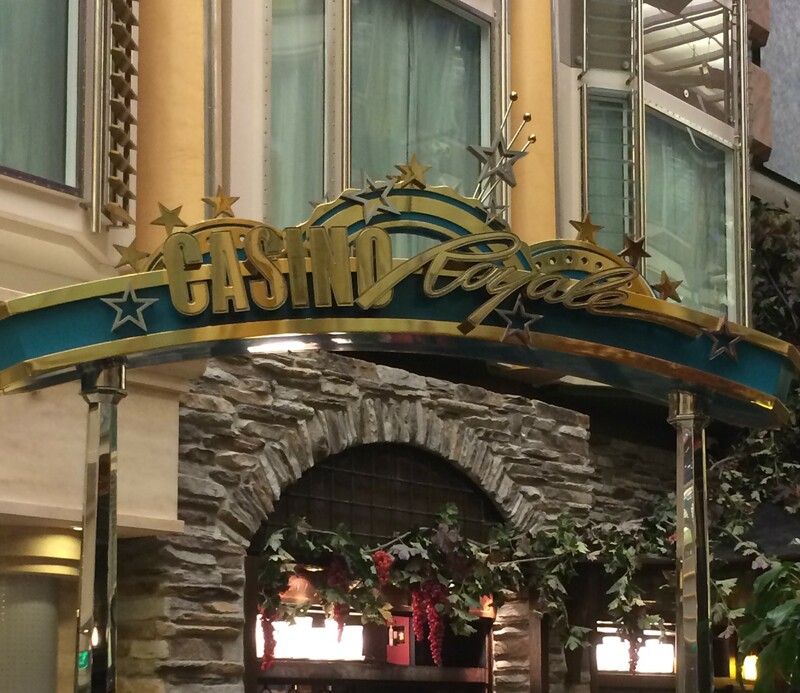 We ended the night in the Casino as per the norm and headed to bed.